2019 – the year of anniversaries: Time to reflect and look ahead. The theme of Hypertext 2019 is “HYPERTEXT – TEAR DOWN THE WALL”. This motto of the 30th ACM Hypertext conference goes hand in hand with the 30th anniversary of the fall of the Berlin Wall. 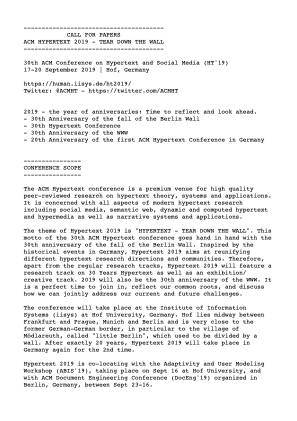 Inspired by the historical events in Germany, Hypertext 2019 aims at reunifying different hypertext research directions and communities. Therefore, apart from the regular research tracks, Hypertext 2019 will feature a research track on 30 Years of Hypertext as well as an exhibition/creative track. 2019 will also be the 30th anniversary of the WWW. It is a perfect time to join in, reflect our common roots, and discuss how we can jointly address our current and future challenges. Regular research papers (max 10 pages, including references) discussing mature work. Short papers (max 5 pages, including references) describing preliminary results of on-going work or novel thought-provoking ideas. Doctoral consortium submissions (max 4 pages, including references + additional CV) describing the work of the graduate student and a CV in order to provide some background information about the graduate student. Late breaking (max 2 pages, including references, presented as poster) presenting innovative research ideas, or preliminary results. Demos (max 2 pages, including references) presenting system prototypes or industry showcases. Exhibition or creative track submissions (max 2 pages, including references) describing the proposed exhibition or creative work. Papers must follow the new layout published in the ACM guidelines (“sigconf” template) and submitted in PDF format. 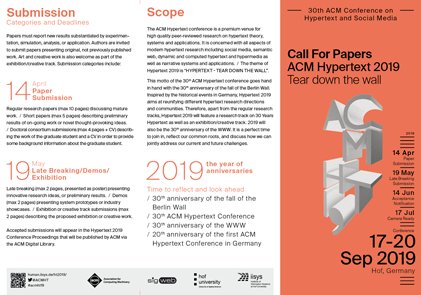 Accepted submissions will appear in the Hypertext 2019 Conference Proceedings that will be published by ACM via the ACM Digital Library. We invite submissions of a broad range of research focusing on reflections on or retrospectives of hypertext approaches and systems. Those should focus on “forgotten” issues, beneficial features, system behavior, or theories that were discovered, but are ignored by current systems. Contributions should be visionary and discuss those old ideas with a strong focus on today’s information systems; they should conclude where and to which extent previously discovered ideas would enhance our current or future applications. Posters and demos will be presented during the conference. They target research and showcases in the above mentioned areas. The conference will include a creative track and exhibition, with readings and performances, workshops, demonstrations of both novel and historical systems, and innovative new work in electronic art and literature. For the creative track, we invite submissions from all disciplines that engage with the expressive potential of hypertext, the link, and of social media-particularly those that address the conference theme of “tear down the wall”. The curated exhibition seeks hypertextual works of any length that explore new artistic forms, or that respond to or engage with older electronic literature. We are especially interested in location-aware and locative work that can be read in or near the conference site. We are open to work on any platform. Questions regarding creative work for the exhibition may be addressed to the curator, Dene Grigar. Limited travel funds and bursaries may be available, as well as assistance and support for installation on site. Proposals for papers, panels, master-classes, workshops, and creative work for the exhibition should be submitted by 19 May 2019. This track is specific for graduate students (PhD or Master). They can present their work and receive immediate and valuable feedback from experts. The HT’19 workshops are described by their own CfP.